Bonds serve a crucial role in helping investors reach their investment goals. They generate income, provide a measure of principal protection and can mitigate volatility. While bonds can help stabilize a portfolio, they are not without risks. Bond investors may worry about rising rates weighing on bond returns. Until recently, such fears have proven unfounded as rates fell to lows not seen in decades. This trend may be turning. Since July, the Bank of Canada has raised its benchmark interest rate twice by a total of half a percentage point, marking the first rate hikes in seven years. The Bank cited strong growth in economic output, employment and wages as reasons for the rate hike. The Bank’s actions have sent yields on the benchmark Government of Canada 10-year bond higher by 36% since the beginning of June1. For bond investors, the recent uptick in rates – and the potential for more on the horizon – is a reminder that their fixed-income portfolios remain vulnerable to interest-rate risk, reinvestment risk and default risk. Fortunately, there are time-tested strategies that can help mitigate these risks. While rising interest rates can pose a challenge for bond investors, not all bond portfolios react in the same way. A laddered bond strategy can help investors by bringing a rules-based discipline to their fixed income portfolio, and removing the temptation to try timing interest-rate changes. Diversifying bond exposure with a laddered strategy may help cushion a portfolio from the impact of rising interest rates. 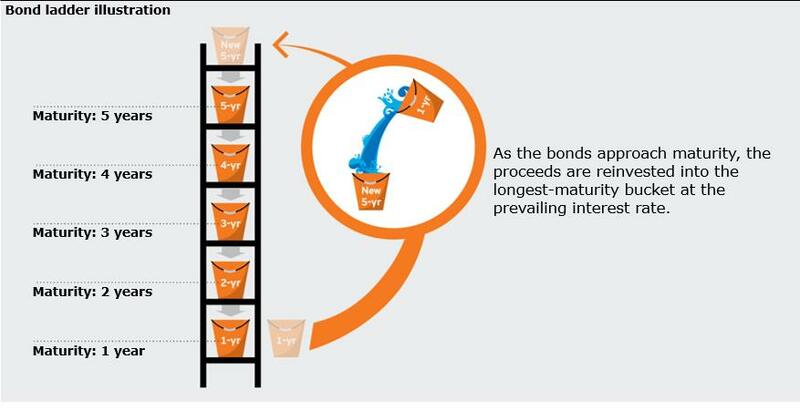 Bond laddering involves diversifying your portfolio into buckets of bonds that span the maturity spectrum. As bonds in the shortest maturity bucket mature, the proceeds are reinvested in the longest maturity bucket at the prevailing interest rate. In a five-year ladder, the proceeds from bonds maturing in 2017 would be reinvested in bonds that mature in 2022. Hypothetical ladder and statistics are for illustration purposes only. The laddering strategy does not guarantee better performance than a non-laddered strategy and cannot eliminate the risk of investment loss. While bonds are used to stabilize a portfolio, changing interest rates can have a dramatic effect on the value of fixed-income holdings. Interest-rate risk is the potential for rising rates to cause bond prices to fall. While many investors view interest-rate risk as a necessary cost for the benefits bonds can provide, rate uncertainty can be unnerving, especially for investors seeking an income stream. A bond ladder may help to manage these concerns by creating a predictable stream of income while diversifying maturities over a pre-determined range. Whether interest rates rise or fall, a portion of the portfolio is reinvested at prevailing interest rates, which helps stabilize the annualized return and partially offset the price impact of the initial shift in rates. Recently, laddered bond strategies have provided more of a cushion during periods of rising interest rates compared to a traditional bond portfolio. Sources: Bloomberg L.P. and FTSE TMX Global Debt Capital Markets Inc. Floating-rate loans are represented by the FTSE TMX Canada Floating Rate Note Index; short corporate bonds are represented by the FTSE TMX Canada Investment Grade 1–5 Year Laddered Corporate Bond Index; overall bonds are represented by the FTSE TMX Canada Universe Bond Index; and long government bonds are represented by the FTSE TMX Canada Ultra Liquid Long Term Government Bond Index. Interest payments from bonds in a laddered strategy can provide a scheduled cash flow. In addition, the ladder can help manage reinvestment risk – the risk to an income stream regardless of the direction of interest rate movements. When interest rates fall, there is a risk that the proceeds from maturing bonds may only be reinvested at the lower interest rate. This risk becomes a larger concern in cases where a large portion of a bond portfolio matures during a period of falling interest rates. In a rising interest rate environment, investors face the risk of having their bonds locked into a longer maturity, and may miss out on higher prevailing interest rates. A bond ladder regularly frees up a slice of the fixed-income portfolio to take advantage of potentially rising rates. Bond laddering provides a framework in which to balance the reinvestment opportunities of short-term bonds with the potentially higher yields that longer-term bonds typically offer. Having a well-diversified bond ladder does not provide a guarantee against loss, but it can provide some measure of protection by managing the reinvestment process with a rules-based approach. Because the purpose of a bond ladder is to provide predictable income over a long period, taking excessive risk may not make sense. Income investors may want to consider focusing on higher-quality bonds. Investment-grade corporate bonds are high-quality bonds that have historically had a low default rate, while providing a higher yield potential than higher-rated securities, such as government bonds. 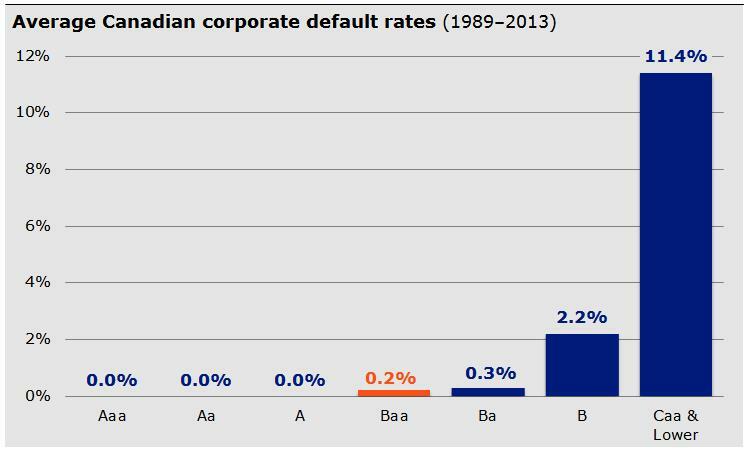 Source: Moody’s Default and Recovery Rates of Canadian Corporate Issuers, 1989-2013. Latest data available. The companies were selected for illustrative purposes only and are not intended to convey specific investment advice. These companies may not be held in the PowerShares 1–10 Year Laddered Investment Grade Corporate Bond Index ETF nor the PowerShares 1-5 Year Laddered Investment Grade Corporate Bond Index ETF (PSB). Composite FTSE TMX rating methodology using ratings derived by S&P, Moody`s, DBRs and Fitch. Shorter duration bonds tend to be less sensitive to interest rates than long duration bonds. Because they are less risky in this regard, they also tend to offer lower yields than similarly rated long duration bonds. Fixed-income portfolios that seek stability by overweighting either short-term bonds or government issues may not provide sufficient income to meet an investor’s goals and are sensitive to changing interest rates. Investment-grade corporate bonds have the potential to offer attractive yields compared to a traditional fixed-income portfolio made up of government bonds while a laddered approach may help lower sensitivity to interest rates. Note: Laddered corporate bonds, as measured by the FTSE TMX Canada Investment Grade 1-10 Year Laddered Corporate Bond Index, offered 23 basis points more yield than the broader universe (as at July 31, 2017), but with a dramatically shorter duration of 4.4 years, compared to 7.3 years. With more Canadians entering retirement, there is a growing need for investments that can help provide quality income as well as serve as a complement to stocks. Having a fixed-income strategy that can help navigate different interest rate environments, while managing the risk, is vital. PowerShares laddered bond strategies can serve as core positions in a fixed-income portfolio. By combining a laddering strategy with investment-grade corporate bonds, these ETFs help manage reinvestment risk, interest-rate risk and default risk, while providing an attractive yield compared to the broad Canadian bond universe. With a shorter time horizon, PowerShares 1-5 Year Laddered Investment Grade Corporate Bond Index ETF (PSB), may provide protection against interest-rate sensitivity and greater capital preservation. The longer time horizon of PowerShares 1-10 Year Laddered Investment Grade Corporate Bond Index ETF (PIB) may provide a core corporate bond exposure with potentially higher yields and more interest-rate sensitivity than the broad universe. For income investors seeking higher returns, a rising rate environment doesn’t need to be cause for alarm. Employing a laddered strategy may help them capitalize on a rising rate environment. Commissions, management fees and expenses may all be associated with investments in exchange-traded funds (ETFs). ETFs are not guaranteed, their values change frequently and past performance may not be repeated. Please read the prospectus before investing. Copies are available from Invesco Canada Ltd. at powershares.ca. There are risks involved with investing in ETFs. Please read the prospectus for a complete description of risks relevant to the ETF. Ordinary brokerage commissions apply to purchases and sales of ETF units. FTSE TMX Global Debt Capital Markets Inc. (“FTDCM”), FTSE International Limited (“FTSE”), the London Stock Exchange Group companies (the “Exchange”) or TSX Inc. (“TSX” and together with FTDCM, FTSE and the Exchange, the “Licensor Parties”) make no warranty or representation whatsoever, expressly or impliedly, either as to the results to be obtained from the use of the FTSE TMX Canada Investment Grade 1-5 Year Laddered Corporate Bond Index, the FTSE TMX Canada 1-10 Year Laddered Investment Grade Corporate Bond Index and FTSE TMX Canada Real Return Federal Non-Agency Bond Index (the “Index”) and/or the figure at which the said Index stands at any particular time on any particular day or otherwise. The Index is compiled and calculated by FTDCM and all copyright in the Index values and constituent lists vests in FTDCM. The Licensor Parties shall not be liable (whether in negligence or otherwise) to any person for any error in the Index and the Licensor Parties shall not be under any obligation to advise any person of any error therein. and constituent list vests in FTSE. PowerShares is a registered business name of Invesco Canada Ltd.
Invesco® and all associated trademarks are trademarks of Invesco Holding Company Limited, used under licence. PowerShares® and all associated trademarks are trademarks of Invesco PowerShares Capital Management LLC (Invesco PowerShares), used under licence.